Houston, TX – In 2009, No Kill Houston sent questionnaires to the candidates running for mayor and city counsel in order to learn the candidates’ stances on sheltering issues in Houston. Annise Parker was one of the candidates who responded to the questionnaire. Since Parker has been in office for 4 years and currently running for a 3rd term, I thought that this would be a good time to review her 2009 responses to find out just how many promises that she has kept during her 2 terms as mayor. 1. Will you commit to supporting offsite adoption centers in highly visible, high traffic locations/retail space all over the City of Houston? After A LOT of searching of BARC’s website, I found only 3 regularly scheduled offsite adoption locations, which are generally open only on Saturdays for only 4 hours per day. These are 3 PetsMart and Petcos locations. I also found 1 location in the Galleria that is open only on Saturdays for only 4 hours. Houston is 600 square miles, yet BARC has only 4 offsite locations that are only open for 4 hours, 1 day per week. So, considering how many lives were saved at this one successful offsite adoption event, logic would dictate that BARC leadership would organize many more just like it. But, logic does not come into play when BARC leadership makes decisions. That event took place in July 2011, and I have yet to hear about a similar event. All the events that BARC organizes take place AT BARC’s facility on Carr Street. This is the location that Nathan Winograd said was not conducive to high volume adoptions. He pointed out that offsite adoption events were critical to increase the adoption numbers enough so that BARC did not kill “for space”. This is also the very same location that the mayor herself said DETERS adoptions. Yet, BARC continues to organize events there instead of more successful locations. 2. Would you support changing/extending BARC’s hours so that working families can get to BARC after work/school to reclaim their lost pets or adopt new pets? BARC’s website indicates that their hours are noon to 5:30 for adoptions and noon to 6 to find a lost pet. Considering the sheer size of Houston, and heavy traffic and congestion on our freeways, I don’t believe that these hours are adequate. Personally, I work until 6:00 pm every day and it has taken me over an hour to drive across town to BARC during rush hour traffic. If I was looking for a lost pet, I could absolutely never make it to BARC before they closed, without having to take off work. If lifesaving were truly important to BARC leadership, one would think that BARC would have later hours at least a couple days a week… especially considering that they can, and do, kill pets, including lost pets, after only a 3 day hold period. 3. Would you support requiring that BARC be open on most holidays since there are generally the busiest adoption days of the year? I would consider it, but I would need to review this with the appropriate HR personnel. This is not happening at BARC. The holidays are very good opportunies for people to bring a new pet home because they have time off from work and school. So, why isn’t BARC taking advantage of these easy opportunities? Nathan Winograd has said that, when he ran the first Open Admission, No Kill animal control/shelter, his shelter was never closed on a holiday. They made it easy for the adopting public to adopt from them. This would make it easier for people to rescue and foster animals for BARC as well since the majority of those people have full time jobs and families. 4. Would you support BARC having longer weekend hours since weekends are busier adoption days than rest of the week? On the busiest days of the week for adoptions, Saturday and Sunday, BARC is open only 5 ½ hours each day. 5. Would you support hiring a new Bureau Chief who is familiar with the programs and services necessary to drop kill rate at BARC i.e. the steps in the No Kill Equation? This has not happened. Before Parker took office in 2010, the city hired David Atencio to manage BARC. Atencio was not at all familiar with the programs and services of the No Kill Equation. Nevertheless, Atencio tried to make some positive changes that would have increased lifesaving. However, his attempts were continually thwarted by ARA management (management that Parker put in charge). Atencio eventually quit in March 2012. I can only assume that Atencio quit out of the sheer frustration of trying to save more lives, but being blocked at every opportunity by city “leadership”. Since that time, Atencio has not been replaced. There is no one at BARC, full time, acting as director. There is no leadership at BARC who is working to implement programs and services that would save more lives. No one. 6. Would you support shutting down the North Kennel entirely and building new kennels to replace it? Yes, as funds are available. The funds for this project have been available since before Parker took office. In 2009, Bill White arranged for several million dollars to be spent on this renovation, yet 4 YEARS later absolutely no work has begun. The North Kennels (aka North Ward) are still an absolute dungeon. For those of you who have never seen the North Ward, see pictures below. Note that the dog in the top photo is unable to stand normally in this kennel. 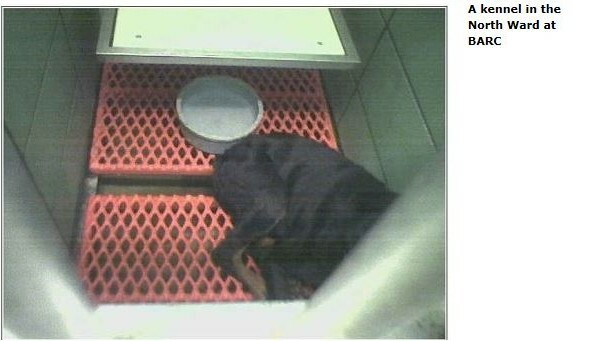 His hind legs are up on top of the metal, flip down, “shelf” in the back of the kennel. The kennels in the North Ward are absolutely appalling. 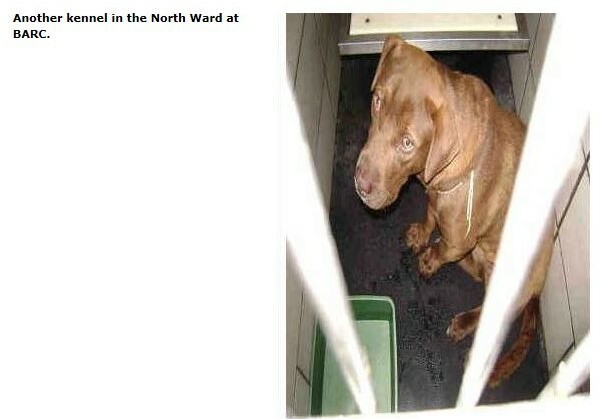 In fact, Nathan Winograd said that they were some of the most poorly designed kennels that he has ever seen. Considering that he has toured shelters around the US and other countries, that is quite a statement. Personally, I have nightmares about animals stuck in those tiny, dark, dank, barbaric cells, too small for larger dogs to turn around or even stand comfortably. The first time that I walked through the North Ward, I saw a German Shepherd standing on his hind legs, with his front paws up on the metal bars. He wasn’t trying to get attention. He was just standing there. He did this because he was too large to stand comfortably in his kennel. That was 5 years ago and the image is forever burned into my memory. The funds to totally gut and rebuild those barbaric kennels has been available to Parker for 4 long years, yet she has not done a thing to make sure that this happened. What has Parker done with those millions of dollars that were set aside for the animals? 7. Would you support a comprehensive TNR (Trap, Neuter, and Return) Program, which has been proven to drop the population of feral cats without killing them? No. I understand the theory and concept. But we need a policy that also balances the need to protect birds and other native wildlife, on which sterile, feral cats have an adverse impact. One, Parker’s statement about feral cats having an adverse impact on wildlife has been blown out of proportion for years. Those wild claims have also been thoroughly debunked. Today, there IS a TNR program at BARC, which I am sure is no thanks to Parker. After all, this is a person who, in 2009, admitted to trapping and taking feral cats to BARC. She did this at a time, when she knew full well that BARC had no TNR program. She trapped and took feral cats to BARC knowing that there was a 100% guarantee that BARC would kill them. 8. Would you commit to making ‘no kill’ – defined as killing less than 10% of pets sheltered at an open-admission shelter – the official policy of Houston and support any laws or policy changes necessary to achieve this goal? This absolutely has not happened. In fact, just the opposite. Parker actually opposed No Kill legislation when it was introduced at the state level in 2011. In addition, BARC’s records show that their Kill Rates have increased every single year that Parker has been in office. If the No Kill model of sheltering had been implemented when she took office in 2010, we would have seen a HUGE increase in life saving. I would submit that, if BARC had begun rigorously implementing all of the programs of the No Kill model of sheltering when Parker took office, that today, 4 years later, BARC would be very close to No Kill status, if not there already. But it isn’t, because the No Kill model of sheltering has NOT been implemented by Parker. 9. Would you support the implementation of performance standards that tie management performance to salary increments or bonuses or continued employment? If not, please explain why not. Yes. The official policy of the city already requires such reviews – it requires a written work plan and annual evaluations based on performance called for under that plan. Apparently, this has not happened either. BARC’s Save Rates have decreased every year for 3 years, yet Parker has kept the same people in management positions the entire time. She has even made statements that BARC management is doing a great job. In any other business, such continued massive failure would not have been rewarded, but apparently, there is no accountability for BARC management under Parker’s watch. 10. Are you committed to supporting/enforcing the recommendations in Nathan Winograd’s recent assessment of BARC? Again, this absolutely has not happened. In fact, BARC has implemented very little of what Nathan Winograd recommended in his nearly 200 page assessment report . Further, in a reprehensible and reckless use of our tax dollars and a reckless loss of precious lives, she actually went so far as to waste an entire year, asking some college students to come up with a solution. Instead of simply requiring that her employees do what has already been proven to work in more than 200 communties, she asks college students for advice. The result? BARC’s kill rates have increased every single year. 11. Would you commit to providing funding to pay low cost and free spay/neuter services to low-income citizens of Houston? This was not attempted until July of this year. After 3 ½ years, BARC, with several partners, finally implemented a so-called “beachhead” program in which they have gone into one low income neighborhood and provided spay/neuter services. As a reminder, Houston is 600 square miles and has many low income neighborhoods who could use these services. So much more could have been done in the last 4 years. Also, I can’t help but notice the convenient timing of this program coincides with Parker’s bid for re-election and the announcement of formidable Mayoral candidate, Ben Hall. 12. No city in America has achieved ‘no kill’ success by implementing a mandatory spay/neuter ordinance. Some cities/counties such as Los Angeles, CA, San Mateo, Co.,CA, Lake Co., CA, Santa Cruz Co., CA and Ft. Wayne, IN have seen an increase in shelter killing after introducing mandatory spay/neuter. In addition, such ordinances require increased enforcement costs, money that could be used for life-saving programs that are correlated with reduced shelter killing. In light of this, would you support a mandatory spay/neuter ordinance, or would you support additional funding to increase access to low cost or free spay/neuter services? See my comments on number 11 above. 13. Would you support the implementation of CAPA i.e. The Companion Animal Protection Act (attached) or some parts thereof? I support it in concept, but as always with legislation, the devil is in the details. This has not happened. In fact, just the opposite. Parker, along with the directors of the other high kill shelters in Houston actually opposed the Companion Animal Protection Act (Hope’s Law) when it was filed in Texas at the state level in 2011. 8) protected feral cats and feral cat caretakers. BARC representatives, and the directors of other high kill “shelters”, again opposed a similar law in 2013. As a reason for opposing this life saving law, BARC’s “director” was reported as saying that if this law passed, then people would actually expect BARC to save more lives. 14. Would you support programs which have been proven to keep pets in their homes instead of being relinquished to a shelter such as distribution of heart worm preventative, food, animal behavioral counseling, low cost dog training, pet friendly rental programs and dog walker referrals? Yes, but not with city funds. Volunteers, who saw the lifesaving potential of a program to help keep pets from being relinquished to BARC, attempted to create and run such a program themselves (it was FREE to the city). They eventually quit, no doubt from lack of support from BARC leadership. Volunteers simply cannot run such a program without the full support and involvement of BARC management. 15. Would you support the reformation of an animal advisory committee as defined by state and city ordinance? If so, how would you, propose that members of this committee be chosen? Yes. I support such a committee and am open to suggestions. I will consult with City Council and other stakeholders on how to proceed with such a task. This committee was reformed, however not a single No Kill advocate was appointed to the committee by the mayor or city council. When appointments were being made for the first committee, I contacted several city councilmembers and asked to be appointed. But all of them told me that a different council person or the mayor would make the appointments. I had the city ordinances in front of me which clearly stated that each of those city councilmembers could have made the appointment, but all refused. Instead the committee was filled with many of the mayor’s “yes people”. In fact, when one veterinarian, who was appointed to the committee, spoke to a reporter about Keiko‘s prognosis while BARC was foolishly performing delicate surgery on her, the vet was kicked off of the committee. It is quite clear that the mayor only wanted “yes people” on this committee; those who would not offer differing opinions from her own. No one on that committee would be allowed to actually speak out for the animals. 16. Have you ever rescued an adopted pet? I currently have 1 dog and 5 cats; all are licensed with the city. All are indoor pets. I found my dog – a 15+-year old pincer cross named Dancer – as an adult stray. Rembrandt is a 15-year old DLH cat that I took home as a stray kitten. Willie is a one-year old DLH cat that I adopted from the SPCA. Cinder is a 19-year old DSH cat that I adopted as an adult stray. Galahad is a 7-year old DSH cat that I bottle fed after I rescued it as an abandoned kitten. Isis is a one-year old DSH cat that I adopted from the SPCA. As you can tell, I am definitely an animal lover. From her inaction over the last 4 years, when it comes to implementing programs that have been proven to save lives; and considering the fact that she trapped feral cats and took them to be killed at BARC herself, I absolutely do not agree that she is an animal lover. A true animal lover would absolutely never do this. In addition, now that we have 4 long years of Parker’s leadership to review, we unfortunately are able to see that tens of thousands of animals have been killed, every single year, under Parker’s watch; that is over 14,000 shelter pets killed or lost by BARC in 2012 alone. Thousands of animals were killed by a city department, under her control, while she did nothing differently. More than 200 Open Admission communities are now saving 90% to 99% of all animals, yet Parker has refused to demand that her employees implement the same successful model of sheltering. No, I do not call this an animal lover by any stretch of the imagination.